On this track you will focus on applications of unmanned air vehicles (UAVs) and ground robots requiring the integration and development of cutting edge technology and algorithms. Each of these applications requires state-of-the-art technology (e.g., computation, 3D printing, sensing), the application of scientific knowledge pertaining to several domains (e.g., robotics, artificial intelligence, motion control, communication systems, computer vision), and an innovative continuous process of improving current and developing new solutions. You are challenged to contribute to this process, right here, right now, in the city of high-tech systems. 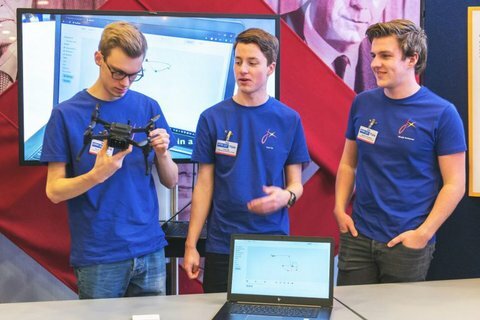 Designing an app that enables the creation and implementation of a show combining drones, light and music; this project is being carried out by team Firefly http://fireflyeindhoven.nl. Setting up and participating in an autonomous drone racing contest competing with other universities; this is the goal of team Cyclone, see https://www.facebook.com/cyclonetue. You will have all the support from the TU/e groups and companies to make your project work. What does it take to do this Honors Academy Track? Are you fascinated by high-tech systems? Would you like to work in a project requiring knowledge from several domains? Do you want to help developing a high-tech system in the same region where many of the world’s leading companies first conceived several high-tech systems? Do you dream of having your own innovative idea for a high-tech system? Then, this might be just the track for you!